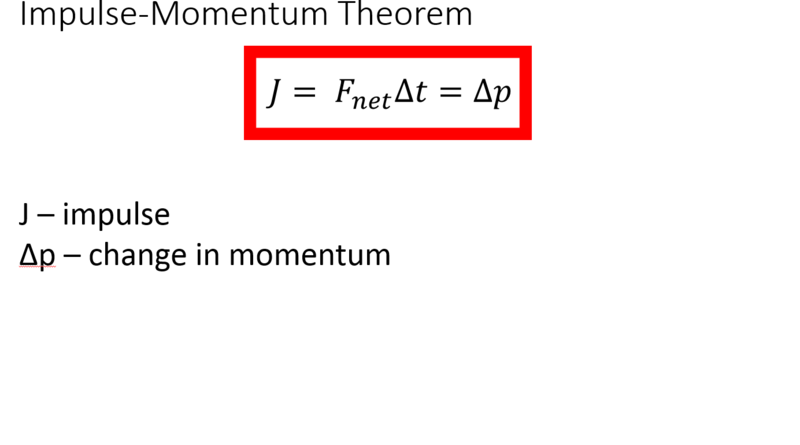 I introduce the impulse-momentum theorem immediately after a lab introducing momentum. 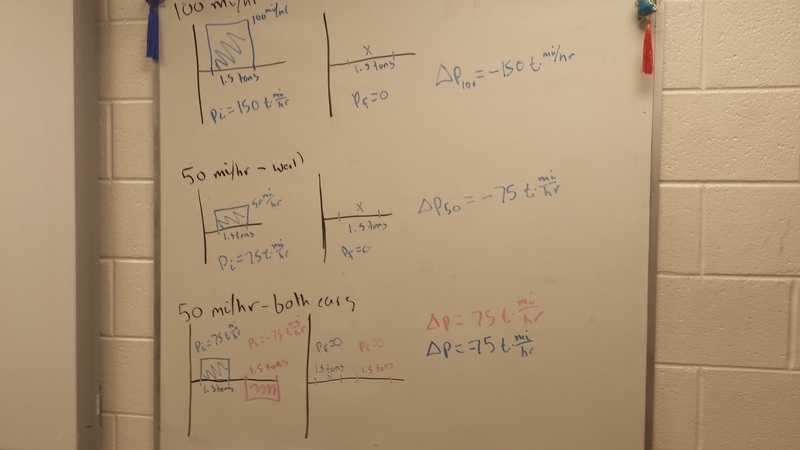 At this point, students have a general idea on what momentum is, including that it’s defined as the product of mass and velocity. The introduction lab helped them see the ratio-centric nature of momentum and interactions. All that said, the general understanding of momentum is still fairly basic and developing. 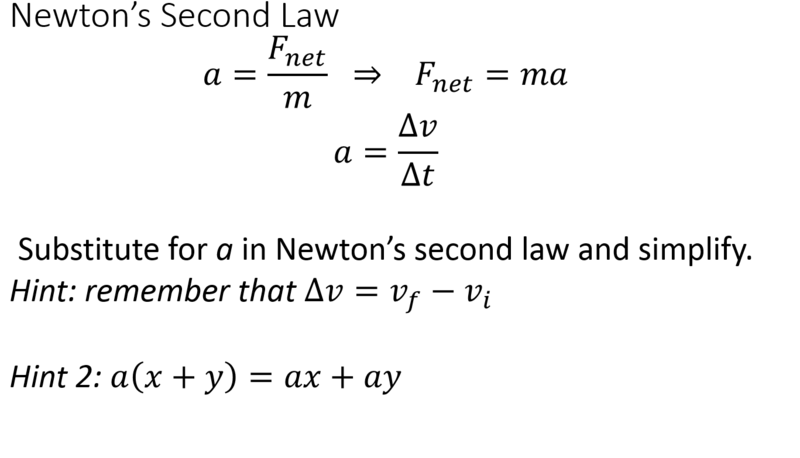 I start with a simple question that essentially has students state the impulse-momentum theorem conceptually. 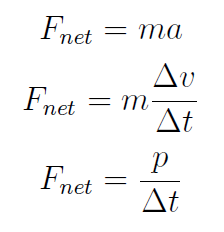 To change the momentum of an object, the forces on that object must be unbalanced. And I was quite satisfied! My response fort when students asked the oft repeated physics class refrain Mr. Register, is this right?, was Almost! Watch me go through it and you’ll see… When I went through my version of the derivation, they seem to see the difference. What’s important is that they’ve gone through a pretty important physics derivation (mostly) on their own. 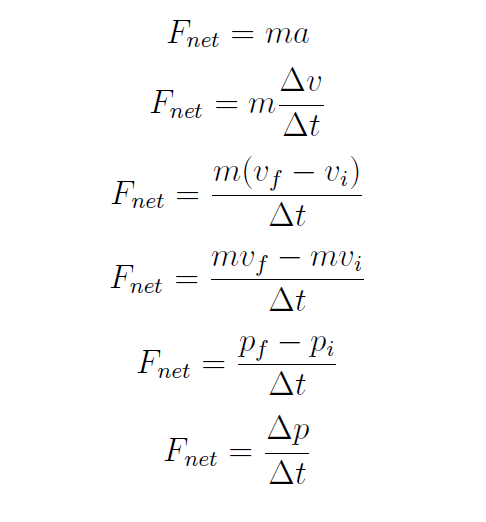 Ok, let’s move that delta-t over to the left side… and we have the impulse-momentum theorem! Huzzah! We have an equation! It’s got a fancy sounding name! Let’s start plugging in numbers! I’m trying to put more focus on understanding equations conceptually, hence the full-stop on jumping straight to plug-n-chug. To accomplish that along with really grabbing my students’ attention, I use this clip from a Mythbusters episode. I stop it before they actually crash the cars together and poll the room, which instantly explodes in conversation and wild theorizing. I have a few students share their thoughts, throw out a few Hmm…‘s and What do you mean by that?‘s, a few inquisitive looks here and there. A head tilt or two. At this point, students are biting at the bit to know the answer. But finishing the video would, in my opinion, flop the entire lesson. While about half my students guessed the right answer, none of them had a fully well thought out explanation supported by even (in my opinion) a reasonable amount of evidence to support their claims. Essentially, they were guessing. Which is a fine starting point, but a poor ending one (see The Most Important Thing (TM) on this post for more of my thoughts on this). 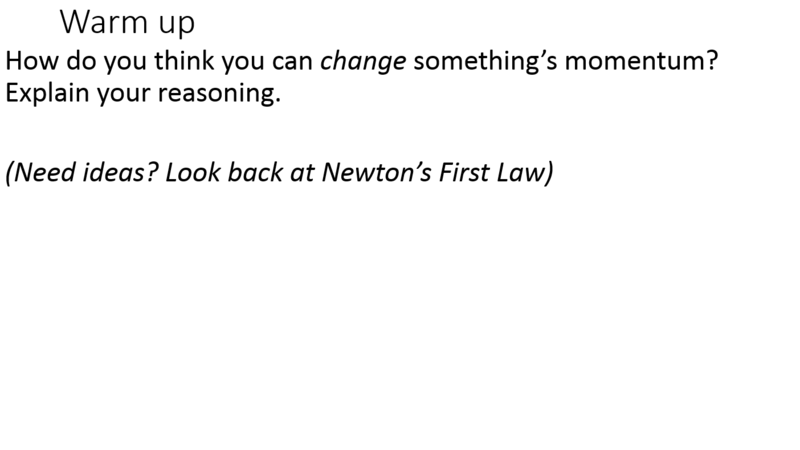 I’m also trying to develop my students’ scientific argument writing skills a la’ the Claim-Evidence-Reasoning framework. I want my students to be able to explain, in detail, exactly why the answer is what it is. 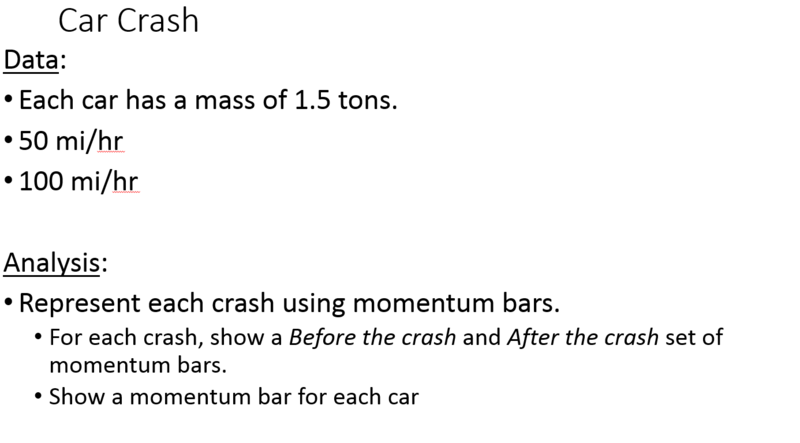 The analysis I have my students do is aided greatly by momentum bar-charts, which they were briefly exposed to during the lab and notes introducing momentum. I also provide some data. The time for every collision is the same. 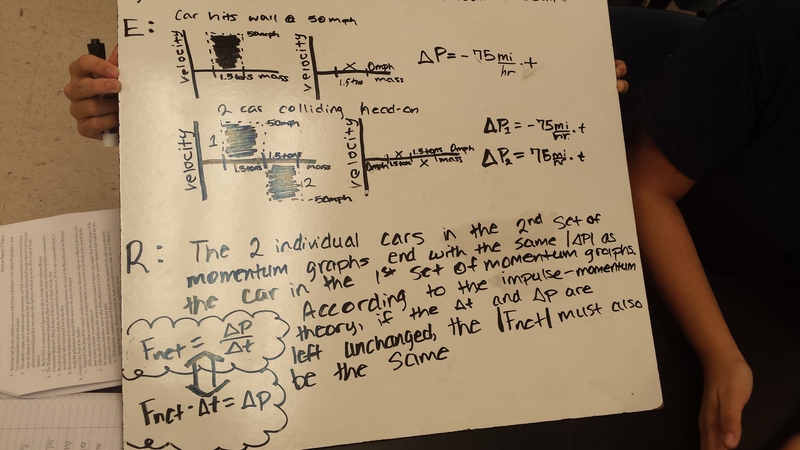 The goal is for students to see that the change in momentum for the cars hitting each other is the same as the 50 mi/hr car hitting a wall. 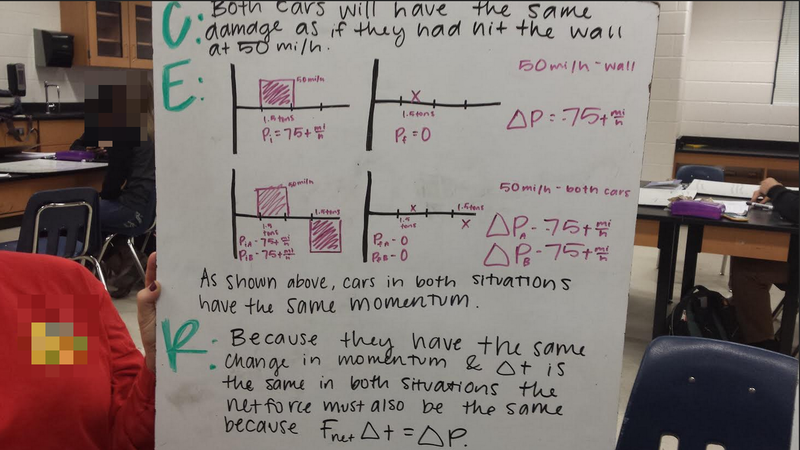 If the change in momentum is the same and the collision time, delta-t, is the same, then the net force on each car must be the same as the 50 mi/hr car hitting a wall. One common thing I noticed is that some groups wanted to add the impulses from each of the 50 mi/hr cars hitting each other together to get 150. Once I pointed out that the impulse for each car was +75 and -75, which added to zero, they’d go back to the drawing board. Others ignored me completely and stuck to their guns. As it turns out, the total momentum being equal to zero is important, but that’s for another day. Another thing I noticed and also found fascinating is that several of my students across different classes mentioned something their Driver’s Ed classes say. Apparently, they’re told that two cars getting hit head on at 50 is like hitting a wall at 100. I responded by asking the students if they thought their driver’s ed teachers were physicists or knew anything about physics. So, it’s true because somebody you perceive to be an authority told you so? That was usually enough to get them to keep digging with the data they had. Up until now, students were doing things in their notebooks. This was enough to fill a 50 minute class period. Day 2 consisted of them putting their arguments on whiteboards and debating with each other in small groups. I had students form pairs and each put their arguments in Claim-Evidence-Reasoning format. Then, I shuffled all the groups around the room so that each pair was presenting to another pair that doesn’t normally sit at their table. 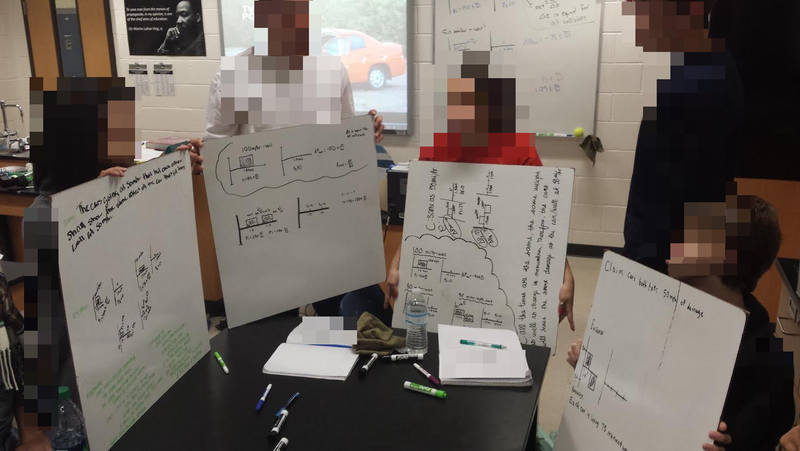 Each group was to present their argument and (heavily) encouraged to modify their own boards if they changed their mind as a result of seeing another group’s presentation. Or add more evidence to support their own arguments if both groups agreed. This here was the highlight of my week. Students explaining and defending their ideas to each other is so beyond more effective than me “sage on the stage”-ing it. And way more fun for them. Many groups got (playfully) passionate about their arguments. They were already biting at the bit for the answer at the end of the previous day. They were downright starving for it today. Once I was satisfied that enough discussion had happened, I played the rest of the video. I then I went through the explanation myself. I will absolutely be doing more stuff like this again. One thing I need to figure out is how to get groups to more readily consider the evidence and arguments of other groups. While the discussions were great, very few groups actually made any changes to their boards, especially if the two groups disagreed. While I enjoyed watching them defend their arguments, nobody seemed ready to budge. I’m not sure if this is even a problem, just unexpected. This activity also ended up being a textbook example of confirmation bias. Students would make a claim, and then do whatever they could to justify that claim. Some would ignore the +75 and -75 and add them to 150 anyway because the 100 mi/hr car hitting a wall had a change in momentum of 150. They’d do this even after I pointed it out. When I asked them to justify adding the numbers in the first place, the response was simply that the cars were hitting each other. Which, as we know, isn’t wrong per se, but it doesn’t necessarily help answer the question. When I’d ask how net force fits into that, I couldn’t get a satisfying answer… but students would continue to dig in their heels. This is basic human nature, of course, but it was interesting to be confronted with it so blatantly. I gave a speech emphasizing to draw conclusions from data, not draw conclusion and then hunt to find a way to justify it. But that alone isn’t going to be nearly enough. One thing I’ll do differently next time is allow one group that got it right to explain what happened instead of me. I was just pressed for time this time, but that shouldn’t be an issue next time as I’ve got a much better idea of how to pace things now. This entry was posted in Uncategorized and tagged activities, CER, lesson plans, momentum. Bookmark the permalink.